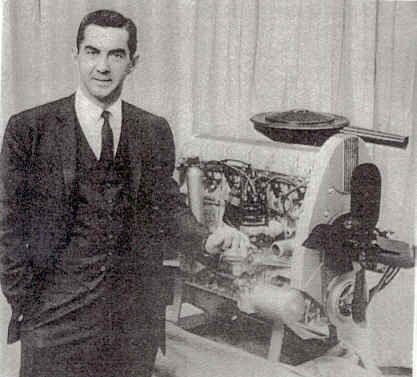 After the Jan 1963 Racing ban to the end of the John Delorean era. 1964-New mid size platform with live rear axle and full perimeter frame and block mounted starters. Pontiac counters the ban with the introduction of a high performance package for the street, enter "GTO" w/ 389 4bbl or 3-2bbl engine, last year for the "slim jim" and hydra-matic trans, 2+2 model introduced. Pontiac again, Car of the Year, GTO sales soar, 2 +2 has 421 standard, revised high rise style intake and bolt pattern. 400 Turbo Hydra-Matic introduced for full size models (thank you). 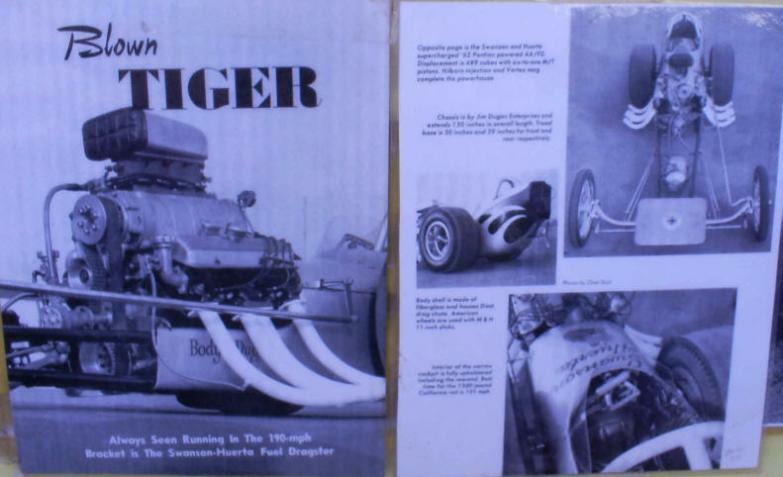 First year for the "Tiger" theme advertising. A service bulletin was issued about the frames being damaged on the intermediates and frame braces were built to remedy the situation, seems they were being ripped out by owners running the cars hard, this applied especially to the stick shift cars. Later in the year, they stretched the front end for a longer wheelbase and gave better handling. They also lowered the front end of the car. 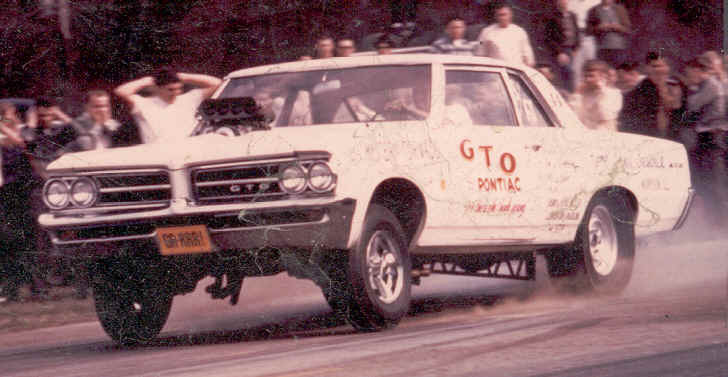 Don Gay built his first funny car out of a '65 GTO. Brother Roy later drove it too. This car was called "Infinity"
1966- Star Chief name now known as Star Chief-Executive. OHC 6 engine introduced, including 4bbl "Sprint" version, last year for Tri-Power, only year that Tri-Power uses all 3 large carbs, GTO becomes its own model, sales peak, stick cars have rear frame braces, headrests now optional for all models, recliner passenger seat available, successful "Tiger" theme advertising is no longer allowed by corporate brass, they said it was"too aggressive". Last year for 389 and 421. Above pic at Bristol Dragway Spring Nationals '66 Car debuted here. 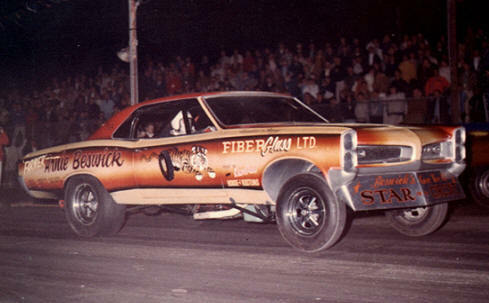 My personal favorite drag car of all time and a BIG influence for my funny car project. Don Gays "Infinity II". 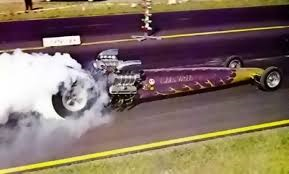 This was a serious high dollar blown-injected 421 powered funny car that ran on nitro as well as hydrazine, benzene and what ever else it took to whump the chevs, SOHC Fords and HEMIs. Low ET to the best of my knowledge is a 7.85! This thing had leaf spring rear suspension (!) and collector street style headers too! That's in '66-7!. Absolutely gorgeous too, it was based on a real GTO shell. Does anyone know what became of this outstanding automobile? 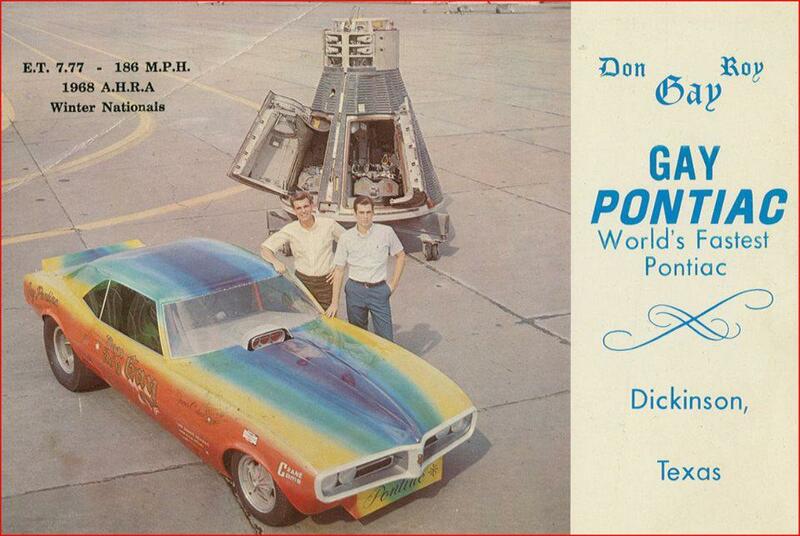 This is definitely significant part of Pontiac performance history! 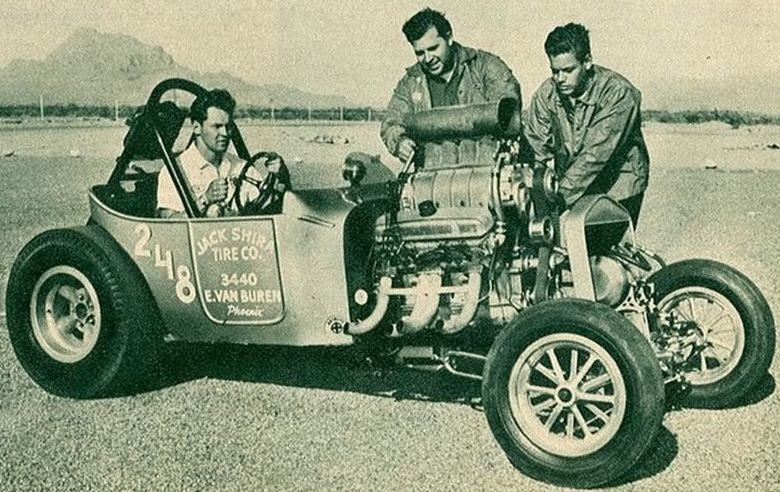 1967-400 and 428 engines introduced with better cyl heads, 2.11" & 1.77" valves, first year for screw in rocker studs, Q-jet makes debut on V-8s, the "Ram Air" era starts officially 4.33 rear gear mandatory. Last year for 2+2 and the 326 engine. GTO, this year dubbed "The Great One" finally gets a performance automatic, the 400 THM, many other options made available for the first time. Some are cruise control, hood tach, Rally II wheels, am-fm stereo. All full size Pontiacs have hidden wipers, "Woody" station wagons available for the first time in the V-8 era, standard on Executive Safari, Pontiac introduces " Lane Change " feature (other GM divisions follow in '68), Firebird introduced with 4 models including the 400. Disc brakes offered on all models, Don and Roy Gays 421SD blown fuel firebird funny car runs a 7.90 at 183mph at Orange County Raceway, Ca. GP offered as a convertible this year only. field to take the win". 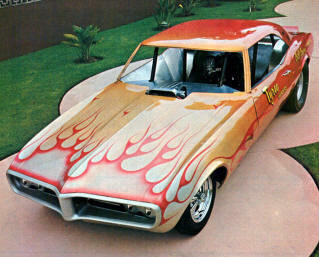 Don Gay's Infinity III Firebird debuted in 1967. This 421 SD Pontiac Funny car really screamed and it was pretty too! 1968-Stunning GTO restyled with rubber "Endura" front bumper, Motor Trend makes it Car of the Year, Hide-a-way head lights offered as option, all engines now have open chamber style heads, 350 engine introduced, shoulder belts standard by about Oct of model year, last year for Grand Prix on full size "B" platform, Mid year Ram Air II introduced with round ex port flanges and computer optimized "041 or T" cam. All '68 models now have side marker lights, Firebird drops vent windows. Jess Tyree builds this Firebird funny car. After running a 421 for awhile, then switches to a Chevrolet eng (Boooo!). Jess continues to this day to run Chevy engines in his Pontiacs (shame) yet still considers himself a Pontiac man (huh?). Later he puts 69 trim on it, cuts the A pillars and bends the roof and adds blue paint. I bought this very rare body (very few vintage Pontiac funny car bodies exist), the roof has been put back to its original shape and the '68 front was put back on. I would like any historical info on this car to add here if anyone has any to share, drop me an email. Plans to restore this rare car is underway for the Pontiac Heaven museum with REAL Pontiac power of course! 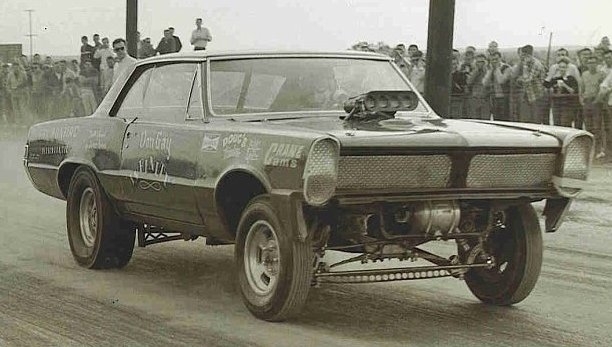 funny car, a '68 GTO. 1969-The "Break-a-Way" year, Trans Am, Custom S & Judge models introduced, new Grand Prix on stretched "A" platform in standard model "J" and top of the line "SJ" (SJ has 4-bolt, big valve, 4bbl 428, Rally gauges and auto leveling). it's a big hit but, it is DeLoreans last big punch with Pontiac. Ram Air IV replaces Ram Air II, Ram Air cars have driver actuated hood scoops, Ram Air IV is the first Pontiac engine since the SD era to have an aluminum intake and forged pistons, vent windows deleted on all hts, headrests now standard, ign key moved to steering column, 428 now standard in Bonneville (standard 360hp only 428 with small valve heads and 2 bolt mains). F. James McDonald became Pontiacs new general manager during the 1969 model year. 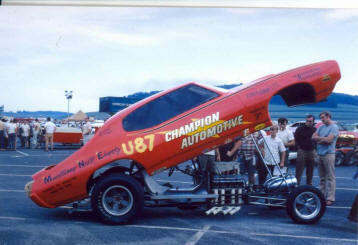 Here is another '69 Judge funny car. 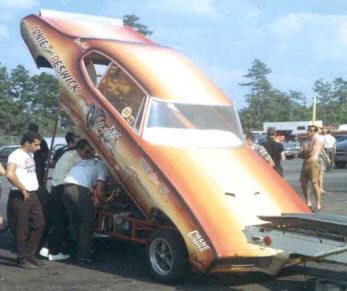 This one from Michigan with an injected Ram Air V on nitromethane. 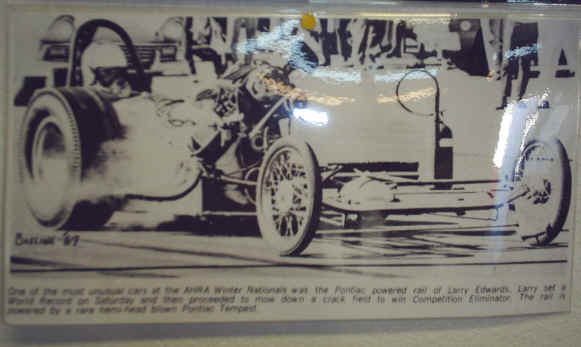 Pontiac did well with its racing program both on the race tracks and in the show rooms. 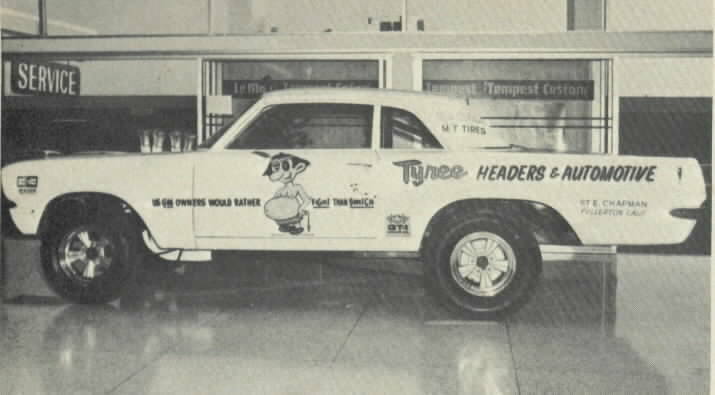 Knudson and Estes and crew had successfully changed Pontiacs image but, now with the racing ban in effect, they had to come up with a new strategy as they were now forbidden to design and sell any racing equip at all. What to do? Well, the new strategy was to aim at the high performance street market. Pontiac would carry their racing victories and image to the show rooms and offer exciting high performance street packages. Enter the era of the GTO, followed by the 2+2 and then the Firebird 400 as the decade went on.